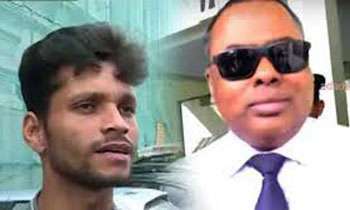 CID today informed the Fort Chief Magistrate that the Government Analyst had identified 123 voice cuts as those of ex-DIG Nalaka de Silva from the 124 recordings sent to the Government Analyst. He had also detected the voice cuts to be tampered by attaching a software device to the complainants mobile phone. The CID said efforts made by them to rectify the deletions had failed. Meanwhile, the mobile phone manufacturer in Hong Kong had assured the CID that they re-marry the deleted parts of the recordings and as such the CID sought Court permission to send the mobile phone to Hong Kong for examination. The CID said the two CDs given to the CID by Namal Kumara had been sent to the GA and were awaiting a response. CID Chief Inspector Ranjith Munasinghe told the Magistrate that their investigations had revealed that Anti-Corruption Unit's director Namal Kumara, the complainant in this case, was an air force deserter who had later joined the Army and thereafter had worked in the Avant Guarde Security Services headed by Nissanka Senadipathy. Counsel Ajith Pathirana appearing for Nalaka de Silva told the Magistrate that according to GA’s report the recordings of the conversation had been tampered and in such an event could not be used as evidence against his client because a tampered recording could not be considered as an original recording. The Magistrate directed the Government Analyst to file a report on the questionnaire send to him by Court report his findings on the CDs sent to him for examination. Ha ha.One did not match!That is the one. No point in them matching because any way he is free to go and come. Go and come. Sri Lankan Police can fool all the people some of the time, and some of the people all the time, but Police cannot fool all the people all the time. Yes we would have been more informed if the contents of the voice clips were divulged to us. This only tittilates. THIS PROVES THE FAMOUS SAYING..... " MAALUVA NAHINNE KATA HINDA"
What a history has this guy Namal Kumara got?? ?Air Force deserter, Avante Guarde operative etc. !! !